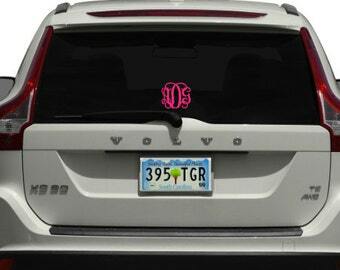 1) Monogram initials in the EXACT order you would like them to appear on your decal. 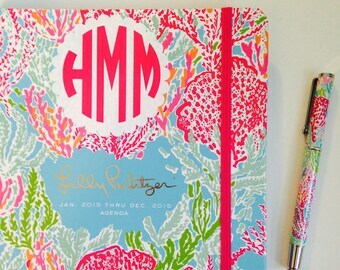 (Typical monogram order is first, LAST, middle initial - Hannah Grace Mitchell would be hMg). Personalize your laptop, notebooks, planners, agendas, cups, mugs, and many other items with a cute monogram to make it yours! > This monogram pictured is 3 inches by 3 inches, and is on a 13" MacBook Pro. > If ordering for a phone, the fonts A1-A5 will stay on longest because they are thicker. The other fonts may start to fall off within 2 weeks. 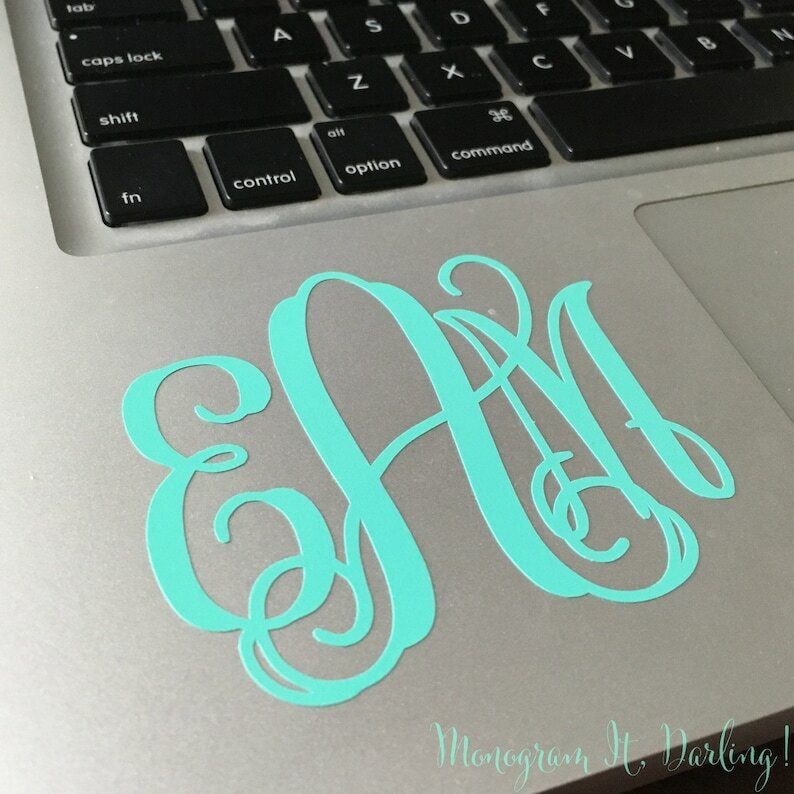 3) At checkout there will be a box labeled, "Notes to MonogramItDarling"
- Your monogram initials in the EXACT order you would like them to appear on your decal. (Typical monogram order is first, LAST, middle initial). > If no style is put, style B1 will be assumed as the style and white will be assumed as the color in order to ensure no delays with your order. > Please make sure you read our shop policies and FAQ section by clicking on the tabs at the top of the listing, underneath the picture. By ordering your item(s) you agree to these terms and conditions, which includes no returns or cancellations. 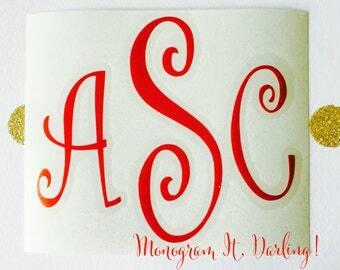 Monogrammed Wreath Sticker Decal | Many sizes and styles! FREE SHIPPING! 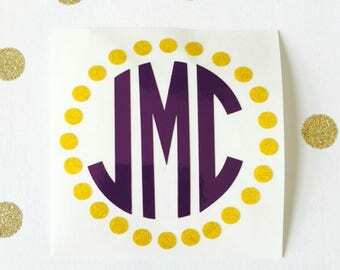 Monogram Decal Sticker | Many sizes, colors, and styles! Gold Foil Monogram- Many styles and sizes! 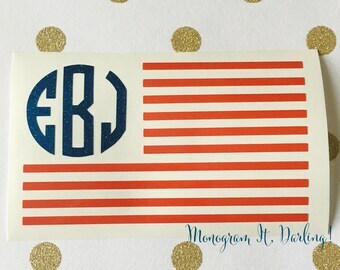 Love these monograms. Perfect for what I needed. All monograms 6 inches wide or smaller are sent via regular USPS "Snail Mail," which does NOT include tracking. Monograms 6.01 inches wide or larger and orders totaling $15 before taxes & shipping will be shipped via USPS First Class Mail WITH a tracking number (3-5 Days). Every buyer has the option to upgrade to shipping with tracking at checkout. Is rush shipping an option? Rush shipping is available for an extra upgraded cost that the buyer pays. The shipping upgrade at checkout does not mean you will get your item quicker. It is still the same turnaround time!! There is a RUSH fee if you would like your item to be put up to the top of the line. I receive around 30-60 orders every day, and cannot move certain orders up just because someone needs it by a certain date. If you contact me before, I will do my best to accommodate your needs, but there is no guarantee that I will actually be able to get it to you on time, without you paying the additional RUSH FEE! Ah! I put the wrong address!! Can I change my shipping address? Yes, if your item has NOT shipped you may change your address. Message me via Etsy Conversations and we will figure it out! Unfortunately, if your item has shipped out, I am unable to change the shipment, and your item will not be replaced for free. A whole new order must be placed to get your decal. My decal was messed up when I got it. Can I get another one? You must send picture proof that it was messed up. If it was my fault I will replace for free! Yippie! Oh darn! I messed up my decal when I was putting it on. Can you replace it? It happens to the best of us. Unfortunately, I will not be able to replace your decal for free, but I can give you a coupon code to get a % off of another one if you ask! Do orders come with instructions on how to apply the decal? Yes! All orders come with directions to ensure smooth and easy application. What is the correct order to place my initials in for a monogram? Monograms for women are placed in the order of first name initial, last name initial, middle name initial. For example, Hannah Grace Mitchell would be hMg. What do I do If I never received my decal? First off, please realize I ship all orders when the shipped button is pressed and you receive the shipping notification. Once I ship it, it is OUT OF MY HANDS and in the USPS's hands! If you haven't gotten your decal, please contact me via an Etsy Conversation! It is very helpful if you go into your order and contact me that way because your order number will be attached. PLEASE NOTE: IF IT HAS BEEN OVER 30 DAYS SINCE YOU PLACED YOUR ORDER, I WILL NOT REPLACE YOUR DECALS. It is best to contact me within 2 weeks! I never received my order, and realized I put the wrong address on my order. Will you replace my decals? Please realize that I import the addresses given on your orders into Excel, and then create labels based upon the shipping addresses the buyer gives, so it is printed the EXACT way you have typed it for your order. I do not change anything on the labels. If you have put the wrong address on your order, & your order has already been shipped, I will NOT replace your decals for free. You MUST WAIT until the order gets returned to me. Once the order gets returned I will contact the buyer & the buyer MUST pay for the shipping fee again (either $0.49 for a stamp or $2.65 for tracking - your choice), for your order to be sent out again, since the funds I had to ship the first time are gone at that point. Have a question that won't wait? Not to worry! Get in contact with me quick by texting 202-688-5518. Standard Message and Data rates apply. 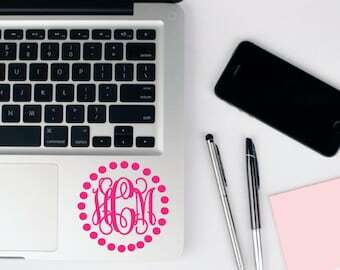 Monogram Sticker Decal with Dot Border - Perfect for Yeti, laptop, car, planner and many more! - Many colors and sizes! Monogram Decal Sticker in Curlz - Perfect for yeti, computer, agenda, car, iPhone, and much more! Monogram decal for car / truck - 5 inches - Many styles and sizes!